Three hotels have been selected for accommodation during the Conferences. They offer a special tariff to Conference participants, and they reserve a number of rooms until the end of June. 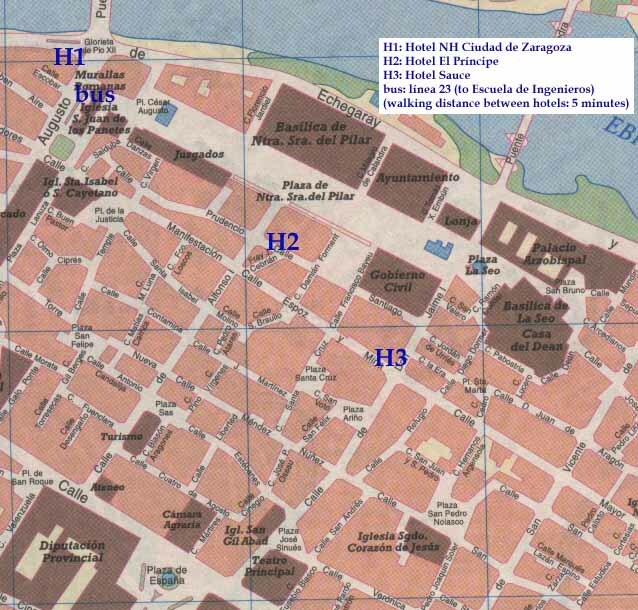 The three of them are located in the historic centre of the city, within 100 m from Plaza del Pilar, less than 5 minutes walking to the bus stop (see map) that drives you to the Conference site (see bus line 23). They were all recently built or renewed (in the 90's), and they provide fully equipped rooms, including air conditioning and direct telephone. Additional services such as parking, laundry, or cafeteria, are also available. To reserve, please contact the hotel of your choice BEFORE THE DEADLINE DATE SPECIFIED ABOVE FOR EACH HOTEL, clearly indicating the reference WODES'02. (Later reservations are not guaranteed to be accepted.) Reservation should be confirmed by the hotel. 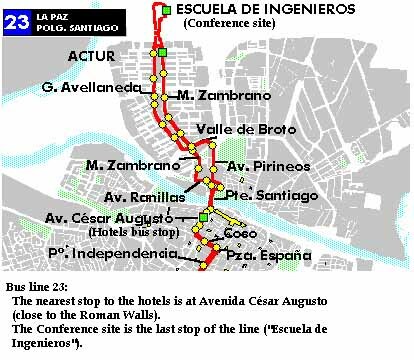 To reach the Conference site (CPS) from the hotels, you can take bus line 23. The most convenient bus stop is the one located at the ancient Roman walls, facing the river (see map). The Conference site bus stop is the last one, but depending on the hour it actually reaches the CPS, or it stops at PRYCA, 5-10 minutes walking to the CPS. Bus fares are 0.60 Euros/travel. A 10-travel ticket will be provided upon registration.